Another International Consumer Electronics Show has come and gone. Among the celebration of every imaginable gadget from self-driving cars to curved smartphones and the latest smart TVs, the Las Vegas event reveals what tech industry believes consumers might want to purchase. This year, wearable technology played a major role at CES as companies displayed a wide range of wearable gadgets designed for everything from streaming live video to baby monitoring and continuously measuring heart rate and blood pressure to help measure a person’s stress level. Companies from Liquid Image, from Santa Rosa, Calif., to Singapore-based Zensorium found their place on the show floor to display their latest wearables. Beyond the crowds at CES, a launch of a wearable spending app made news for being one of the first big tests of the technology in the financial services industry. 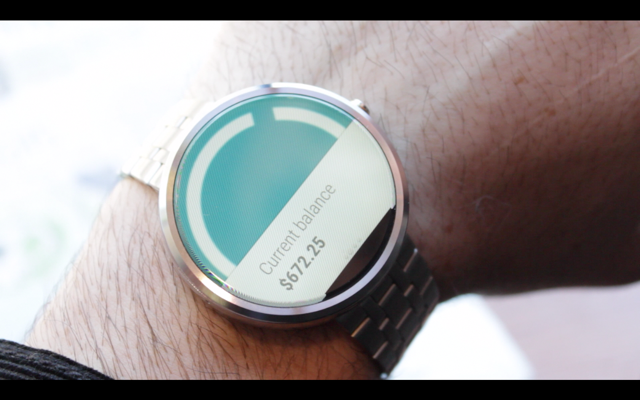 Moven, a startup offering banking that’s designed specifically for smartphones, has launched a modified smartphone app, which helps people manage their money on a smartwatch. 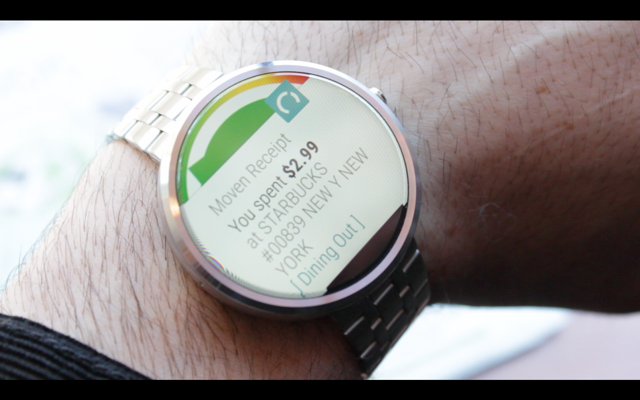 The new smartwatch version of the app provides an analysis of the wearer’s spending habits. For instance, as a customer walks out of a casino, he or she will get an alert telling them how much they just spent and whether they’re still on budget, or should have gone to Trader Joes to get dinner and eat at home. The app is simple. It’s spending meter turns red, green or yellow depending on how much a customer has spent overall in the current month versus the previous month, keeping them on their budget. The company’s launch of its smartphone app comes at a time when banks are rethinking their digital strategies, especially to appeal to millennials, (born after 1981), who are more comfortable using technology and non-traditional financial institutions to help them manage their finances. The difference with this app is it can run independently of another device. It isn’t clear how many Moven customers have smartwatches or how many may use them to monitor their spending, but in a statement announcing the app’s launch, Moven noted IDC figures that show wearable technology is expected to grow 78 percent each year until 2018, with the number of devices surpassing 19 million alone last year and expected to reach some 112 million by 2018. So far, what the smartwatch does better than any other device is deliver alerts. Users on the Moto360 and the Samsung Gear are able to check and see if they’re in the green, or spending less than their monthly average; yellow, spending around average; or red, spending higher than average. The goal is to help wearers make more mindful spending decisions and change their financial habits. “Wearable technology is a powerful way to offer additional support to users looking to improve their spending habit and learn what kind of purchase get them into trouble,” Sion said. But if you’re expecting to see hundreds of Las Vegans using this and other financial smartphone apps, you’re going to have to wait for a while. The landscape for these devices is sparse for now in Southern Nevada, with more traditional financial institutions, U.S. Bank and Wells Fargo piloting smartwatch banking apps. Wallaby Financial, a personal financial management provider owned by Bankrate, has apps for the Samsung Gear 2 and Pebble watches that let users review their card balances and check other personal financial information. It’s that time of year when investors, members, customers and analysts get updates on the financial health of their banks and credit unions. In other words, get ready for a slew of annual and quarterly earnings reports over the next few weeks from banks and credit unions operating in Nevada. East West Bancorp, City National Corp, and Western Alliance Bancorp will announce fourth-quarter and 2014 earnings this week. Zions Bancorp., parent of Nevada State Bank, will report fourth-quarter and 2014 earnings on Jan. 26. Analysts expect the Salt Lake City-based bank holding company to report fourth-quarter earnings of 43 cents per share, and $1.81 per share for 2014. Zions posted a 32 cents per-share loss in the fourth quarter of 2013, and earnings of $1.58 a share for 2013. East West Bancorp, parent of East West Bank, which operates a single branch on West Spring Mountain near Decatur, will release fourth-quarter and 2014 earnings on Wednesday, followed by Western Alliance Bancorp on Thursday. According to Zacks Investment Research, East West is expected to report fourth-quarter earnings of 65 cents per share, compared with 55 cents per share for the same period last year. For 2014, analysts expect East West to post earnings of $2.42 a share, compared with $2.10 in 2013. Western Alliance Bancorp, parent of Bank of Nevada, is expected to post earnings of 43 cents a share for the fourth quarter, compared with 36 cents for the fourth quarter of 2013, and $1.65 per share for the full year, compared with $1.31 a share in 2013. Analyst estimates compiled by Zacks Investment Research expect City National Corp., parent of City National Bank, on Thursday to report fourth-quarter earnings of $1.12 a share, compared with 95 cents a share for the fourth quarter of 2013. For 2014, analyst expect earnings per share of $4.27, up from $3.99 in 2013. NEXT: The Banking Insider column on Feb. 2 will have updated earnings information and analyst comments for a number of local financial institutions.